The Oklahoma City Thunder handled a shorthanded Memphis Grizzlies team with ease on Thursday night taking the victory at 117-95 and picking up their ninth win in the last 10 games played. 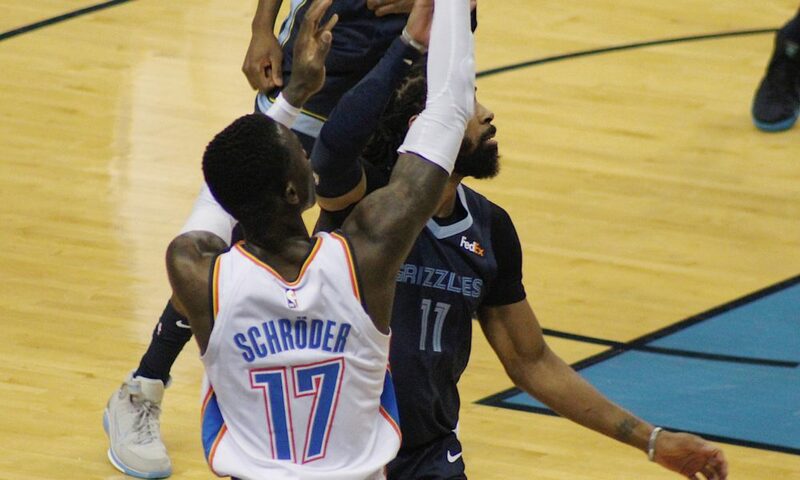 Despite a stagnant offense in the first half, Steven Adams picking up three fouls in six minutes, and the Grizzlies gaining a 9-point advantage over the Thunder in the second quarter, halftime made all the difference for OKC, and the Thunder were able to outscore the Grizzlies 66-42 in the second half to secure win No. 35 of the season. OKC had a troublesome start, not only with foul trouble, but with strong shooters like Terrance Ferguson going 0-5 from downtown to start the game. Ferguson has become an adamant shooter for the Thunder where his shooting confidence has skyrocketed, but tonight was a slow start for the second year as he didn’t hit a 3-pointer until the third quarter. Russell Westbrook checked off another career accomplishment picking up his 8th consecutive triple-double at 15-13-15 and is now only one triple-double away from tying Wilt Chamberlain for longest consecutive triple-doubles streak in a season. Paul George continued his dominance on the offensive end of the ball ending with 27 points where six of his seven made shots were from the 3-point line, and George finished 7-16 on the night. He also carried over on his well-recognized defense with four steals contributing to the Thunder’s 17 steals. While this game may not have had much flavor to it, Jerami Grant was a guy who had a shining opportunity to showcase his growing talents finishing with 20 points on 8-11 shooting. Grant, who I would say is having his best season yet with the Thunder, is a player I’m continually impressed with by the difficulty of the shots he takes and how easy he makes it look. Along with guys like Westbrook, Ferguson, and even Dennis Schröder (Yes, you read that correctly), Grant had ample opportunities for some great dunks to bring life to Chesapeake Energy Arena, and the Thunder walked away with this win. With the All-Star break approaching quickly, the Thunder have done an excellent job playing hard, strong, and diligent to remain as a top contender in the Western Conference, and OKC moves to 35-19 in the season. The Thunder will be in Houston on Saturday to face James Harden and the Rockets before returning home on Monday night to host the Portland Trail Blazers for the second time the season inside Chesapeake Energy Arena. With James Harden continuing his powerful performances of 30+ points on a nightly basis, and Russell Westbrook searching for a ninth straight triple-double, Saturday’s matchup is one to keep an eye out for. Watch below to see full postgame pressers from Dennis Schröder, Terrance Ferguson, Steven Adams, and Russell Westbrook following Thursday night’s win over the Grizzlies.